AO had this hob at about £390 a few days ago as did John Lewis etc. Ordered this from B & Q on Sunday - when it was £390 at AO.com - heard nothing from B & Q about delivery so now cancelled my order and went with AO. Its £16 more but AO customer service is way better and you get Saturday/Sunday delivery. Wow, been looking for an induction hob after I stupidly smashed my halogen one. I'll try b&q, hopefully they can come up trumps. Thanks for posting OP. Wow, been looking for an induction hob after I stupidly smashed my … Wow, been looking for an induction hob after I stupidly smashed my halogen one. I'll try b&q, hopefully they can come up trumps. Thanks for posting OP. It's just I can not see them advertising the cashback, whereas ao.com does. Are you sure that B&Q qualify for the cashback as the terms state8. The … Are you sure that B&Q qualify for the cashback as the terms state8. The Promotion is offered via participating retailers only and only participating retailers will have the official advertising literature.It's just I can not see them advertising the cashback, whereas ao.com does. Would be worth doing a deal for the one on ao.com. £213 with cashback is still good & if you use top cashback you can get 2%. Would be worth doing a deal for the one on ao.com. £213 with cashback is … Would be worth doing a deal for the one on ao.com. £213 with cashback is still good & if you use top cashback you can get 2%. AO price matched.Hot from me. How did you go about getting the AO pricematch? Can you get TopCashBack with the AO price match? The outlay on induction compatible pots/pans will also have to be considered if you are looking at cost. Good hob though! True, but an induction hob will bring a pan of water to the boil much, much quicker than gas - offsetting much (if not all) of the extra cost by not having to run the hob as long as a gas one. Yes it can, it can also be more expensive, it depends on various factors. Interesting that. By the way, voted hot for a good deal. This, but also there are other factors than just cost per unit to consider to compare actual running costs, so much more than most people consider. "True, but an induction hob will bring a pan of water to the boil much, much quicker than gas - offsetting much (if not all) of the extra cost by not having to run the hob as long as a gas one." "As almost all of the heat generated is transferred into the food, they (induction hobs) use considerably less energy than other hobs… The energy requirement of an induction hob is 15-50% less than that of a conventional gas or electric hob." Why do the images differ from each other (B&Q & ao)? It's quite possible I'm being a little thick here but, I don't understand your point. Are you for or against induction hobs?! Whether it's gas or induction, the costs of running a hob amount to very little. Induction is cleaner than gas and other kinds of electric hob. Gas makes lots of water and is a devil to clean with all the nooks and crannies. Ceramic hobs get hot and stuff gets burned on. Induction hobs do get too hot to touch, but only because they have hot pans on them, so don't get hot enough to burn food on to. You can actually boil a pan of water with a sheet of paper under the pan. Speed is incredible compared with gas and especially other types of electric. And best of all is the timer on each of the four plates. You bring the pan to the simmer, set the timer and it turns off and beeps when it's done. No more overcooking anything. I've had one for many years now and wouldn't look at anything else when it breaks. Downside is you'll probably need to buy new pans as induction needs a high iron content in the pan to work - test with a magnet, and if it sticks to your pans, they'll work with induction. Thats not really true now. You just made that up. Looking at the specification, I don't think this will be a good hob, it's only rated at 16A meaning I'd doubt the power output is very high. Our IKEA induction is 40A. And has power boost on 3 rings with tandem arrangement, it was about the same price as the rrp on this. I can't see why bandq would not be listed as a cashback retailer. Here's hoping. Ordered but no delivery date. I would not order anything from b&q. the last five things I have ordered have been cancelled a long time after taking my money. The customer service is also diabolical. I would urge anyone to give their money to other more deserving companies first. That way you might even end up with the stuff you paid for too! Cheers OP . Ordered from A.O . Went through Nectar as its triple points. Delivery for Sunday. Just got to find a deal for some new pans now ! Looking at the specification, I don't think this will be a good hob, … Looking at the specification, I don't think this will be a good hob, it's only rated at 16A meaning I'd doubt the power output is very high. Our IKEA induction is 40A. And has power boost on 3 rings with tandem arrangement, it was about the same price as the rrp on this. I can't see why bandq would not be listed as a cashback retailer. Here's … I can't see why bandq would not be listed as a cashback retailer. Here's hoping. Ordered but no delivery date. Induction Hobs are far more modern and safer, also they are far easier to keep clean. Personally I would not buy this low rated hob, there are far better available. i just got a new kitchen installed and got a gas hob. Dont like electric when cooking. i just got a new kitchen installed and got a gas hob. Dont like electric … i just got a new kitchen installed and got a gas hob. Dont like electric when cooking. 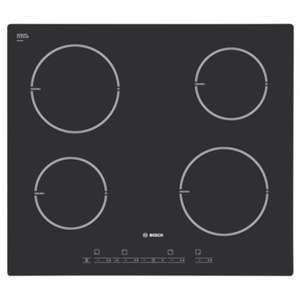 And what was your experience with an induction hob like? got both - gas for specific stuff eg stir fries but induction day to day is a dream. Just a little word of warning: if you have had a pacemaker fitted you're supposed to keep a distance of at least 60cms between your pacemaker and an induction hob as the electromagnetic field may interfere with your pacemaker settings....not something I'd ever thought about but read about it in Which last night and Which was asking people to let them know if they were warned about this by retailers prior to buying an induction hob. Sorry to be dumb but what do the power levels mean ? I just want to know if Ive ordered a decent hob or not !! Online retailer called Appliances Online - there is a link to them in the second post. No idea - I suspect B&Q are pretty bad at keeping their website updated....tbh I'd go with AO - its slightly dearer but you're more likely to get the hob and the cashback.